Walking Riley along Riverside Park today, taking a look at the aftermath of Sandy. Almost all of the leaves have been blown off of the trees in the park – yet the roses and asters are still blooming! 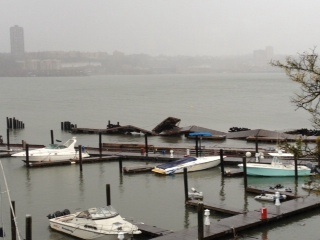 It appears that the largest amount of damage was literally on the waterfront – some of the docks at the 79th Street Boat Basin were lifted and stacked neatly like collapsed dominoes. It was kind of interesting, walking through the streets that are closed to traffic, with deep puddles and fast-moving clouds above. Lots of people out, walking around – some stir crazy, others just crazy!